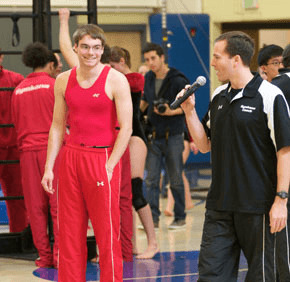 Before his sophomore year at the University of Maryland in College Park, Joe Kreft had never participated in gymnastics. Hearing about and seeing Maryland’s Gymkana exhibition team, Kreft was intrigued. Kreft, now a Maryland junior, returned to his elementary school, St. Agnes in Catonsville, Feb. 10 as an integral member of the Gymkana Troupe, which has appeared on the America’s Got Talent NBC television show. St. Agnes students successfully completed a wrapping paper fundraiser to earn the Gymkana visit to the parish center by raising more than $28,000 for the school. Students bounced about in the center’s bleachers, letting out “oohs” and “aahhs” as the Gymkana members flipped all across the room Feb. 10. In between routines, Gymkana members reminded St. Agnes students to avoid the trappings of drugs and alcohol. It was an added bonus for the school that Kreft was on the team. One of his St. Agnes classmates, Dominique Parkes, is also on the Gymkana team, but couldn’t make the trip. Since Kreft graduated, St. Agnes built the parish center, which also serves as a gym. While there were many new touches at St. Agnes School, Kreft couldn’t help but walk down memory lane. Kreft, and his family, remain parishioners at St. Agnes. He was a student at the school from kindergarten through eighth grade, before moving on to Loyola Blakefield in Towson and the University of Maryland in College Park. While Banks wasn’t principal while Kreft was a student at St. Agnes, she does know him because his mother was Banks’ administrative assistant for several years. Kreft specializes in vault and trampoline and has been sculpted physically during the last two years thanks to nearly 10 hours of practice a week. “This has probably put me in the best shape of my life,” he said. As Kreft finished the first of two shows for St. Agnes students, he couldn’t help but think about far he had come. He hoped it would inspire St. Agnes’ current generation of students. “To come back here and show what I’ve done and show the kids what they can do, it means a lot,” Kreft said.